Open faced sandwich for breakfast. Radish variety - multi-colored "Easter Egg." Stepping out into the garden with a cup of tea this morning to examine the overnight happenings,I found most of my radishes had bolted but a few were still intact and in good condition for fresh eating. This fact,together with the knowledge that a crusty loaf of bread and and a pad of home made butter were up in the kitchen waiting to be used,called for one of the simplest and most delicious seasonal breakfasts – the French radish sandwich. 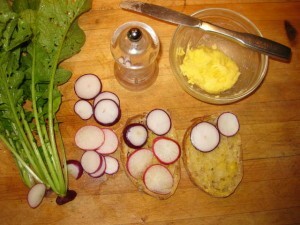 Just slice juicy radishes,not too thin,and place them on buttered bread,sprinkle some sea salt over the radishes and bite into them open faced. Yum. It’s a creamy,crunchy,tasty treat. It may sound bizarre,but trust the French when it comes to food. This is really good. Even radishes that are strong enough to bite you back are somehow tamed by the salt,starch and fat. My first effort at making butter turned out to be a cinch. We recently started getting raw milk from a local dairy and experimenting with making various dairy products. Yesterday’s rainy afternoon was perfect for stirring up a batch of yogurt,mozzarella cheese and butter. After skimming off the cream and bringing it to room temperature,I whipped it in a blender until it thickened beyond the whipped cream stage. Then poured it into a clean jar,covered it, shook the jar hard for a minute,sloshed the liquid gently for another several minutes and voila! Golden yellow butter curds separated from the buttermilk. Strain,wash butter in cold water to remove all buttermilk and chill. Because the deep color of the butter is an indication that the cows were feeding on the tender,vibrantly green grasses and clovers of early summer,I can convince myself that this butter is healthy enough to slather generously! This was an inspiration. I had just bought a bunch of huge crunchy radishes at the farmer’s market. Another bread and butter thing I like to do is slice peaches or strawberries and layer them on bread. Maybe sprinkle with a little sugar.